Gorkha Janamukti Morcha (GJMM), the political outfit in the Hills demanding separate state of Gorkhaland, suffered another split on Friday when eight of its central committee members broke away and floated a new forum - Dooars -Siliguri - Terai Bharatiya Nepalese Developmental Forum. Significantly, the eight met Chief Minister Mamata Banerjee at Nabanna during the day and sought her help in addressing the problems of the people from the Terai-Dooars areas. Its chief convener, Praveen Singh, said that the forum has placed the demand for a separate board for the Terai-Dooars people on the similar lines of Lepcha, Bhutia, Tamang and Mangar Boards. This is the second time the GJMM is facing a crisis after its MLA from Kalim pong , Harka Bahadur Chhetri, broke away from the party a month ago and formed a political platform, Jana Andolan Party (JAP) in protest against the authoritarian attitude of the GJMM president, Bimal Gurung and the arbitrary way he was running the Gorkha Territorial Administration, an autonomous body formed for executing the administration and development in the Hills. Chhetri has come in full support of Chief Minister Mamata Banerjee and her vision of development for the Hill people. 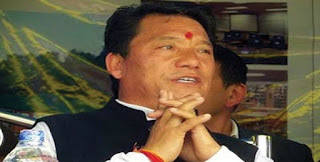 He said that while peace prevailed in the Hills and people were benefiting from the development work of the Trinamul Congress government, Gurung was unnecessarily trying to create tension in the area by stoking the demand for Gorkhaland.